Jean-Marc Vallée is slowly becoming a very interesting filmmaker, with films like C.R.A.Z.Y., The Young Victoria, Wild and Oscar juggernaut Dallas Buyers Club showing off the Canadian director’s particular and off-kilter style that somehow through tight editing and sharp focus on character gets through to the core of the emotion as well as the heat of the moment. He can even manage to make scripts by sophisticated writers like Julian Fellowes and Nick Hornby appear just as fascinatingly unhinged, even when they’re not all that strong to begin with, and we mean that as a compliment – it’s all part of the style that makes him such an intriguing talent behind the camera. The next film in his filmography is Demolition, a comedy-drama that explores the feeling of grief and the ability to connect in the wake of tragedy, and once again Vallée has managed to make a flawed screenplay somehow work more than it should on the big screen – but this time, he’s got another secret weapon on his side: Jake Gyllenhaal. He plays Davis, an investment banker who in the very first scene loses his wife (Heather Lind) in a car accident, but while everyone else around him, including her father (Chris Cooper), is able to express their sorrow, Davis simply can’t. Try as he might, including forcing a tear while looking in a mirror, nothing seems to emotionally stir him, except for a series of lengthy letters he writes to a vending machine company responsible for a snack he purchases at the hospital where his wife dies getting stuck, gaining the attention of customer service rep Karen (Naomi Watts). His increasingly erratic behaviour eventually stems into dismantling things in his luxurious home and office, from a fridge to an entire bathroom stall to soon the house itself. All the while, however, Davis doesn’t seem willing to emote or even open up about his wife’s death. By most accounts, it’s not hard to understand why some people would refuse to sympathise with a character like Davis. His privileged background aside, from the comfortable living space and secure job to the vast amounts of money he earns from his job, he grows more and more sociopathic and anti-social as the film goes on, driving a wedge between concerned family members, and freaking out unassuming members of the public such as a wrecker whom Davis pays to help demolish an old house in his business suit. He is a very unhinged character, one who we know for certain desperately needs professional help, and we would ultimately write him off as a miserable and unlikable sod of a protagonist, if it weren’t for Gyllenhaal’s nuanced and consistently fantastic performance. Like Vallée, he is becoming more and more fascinating with every project he seems to choose, sometimes being the best thing in an otherwise mediocre film like Southpaw, and here he is given the difficult task of somehow making this character with such questionable attributes genuinely likable despite the odds, which he not only pulls off but also adds layers to the character that perhaps screenwriter Bryan Sipe might not have thought of, be they emotional or even spiritual. Gyllenhaal is so compelling in this role, as is the supporting cast including Watts, Cooper, and Judah Lewis as Karen’s son who’s slowly discovering he might be gay, as well as Vallée’s tight-knit direction, that the script’s more obvious faults are better disguised. It is compiled of very loose threads jumbled together into one plot, with several developments like a scholarship set up in Davis’ wife’s name, Karen’s own domestic complications such as raising her adolescent son and coping with her temperamental boyfriend who’s also her boss, and several episodic coping mechanisms that Davis partakes in to fill the void of his non-existent emotions, such as bonding with both Karen and her son and finding temporary joy in painful attributes from a nail in the foot to being shot at with a bullet-proof vest. Tonally, it can meander quite a lot, which doesn’t perhaps make it as solid a film in Vallée’s personal filmography as some of his other ones. But Demolition is still worth a watch regardless, if only to witness the beautiful marriage of Jake Gyllenhaal’s acting and Jean-Marc Vallée’s filmmaking style, both of whom make this film work more than it should. 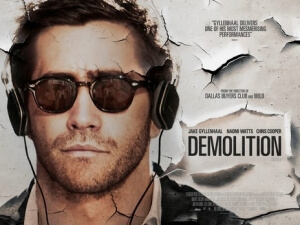 Demolition masks its more obvious flaws, such as a meandering script that contains several loose plot threads, with a masterful lead performance by Jake Gyllenhaal and a solid directorial style by the increasingly reliable filmmaker Jean-Marc Vallée.